ERGONOMICS : Compact and ergonomic design at only 8-1/8" long and weighs only 5.9 lbs. 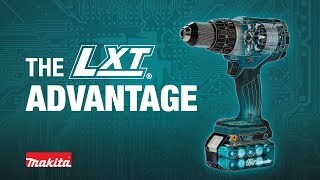 The 18V LXT® Lithium-Ion Cordless ½” Hammer Driver-Drill (model XPH07Z) breaks new ground with a full 1,090 in.lbs. of torque for the most demanding drilling and driving applications in wood, masonry and metal. It's powered by a Makita brushless motor for longer run time, increased power and speed, and longer tool life. The XPH07Z is positioned at the top of Makita’s deep line-up of driver-drills, and is a workhorse tool engineered with durability features for operation in harsh job site conditions.